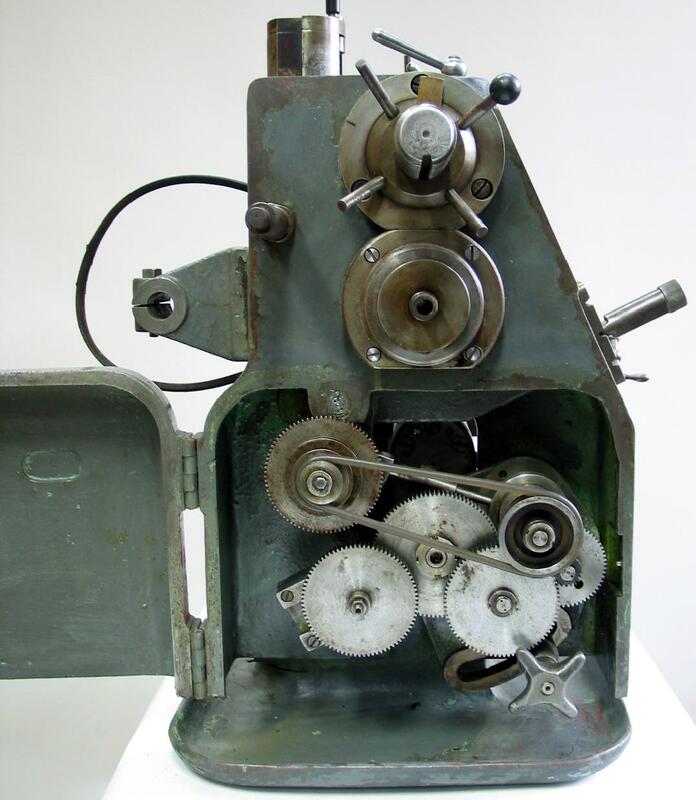 Manufactured in the late 1940s by Hartensteiner Maschinenfabrik, but marketed as the "Piho Reparaturbank", this interesting combination machine was advertised as a unit that would be particularly in repair shops. 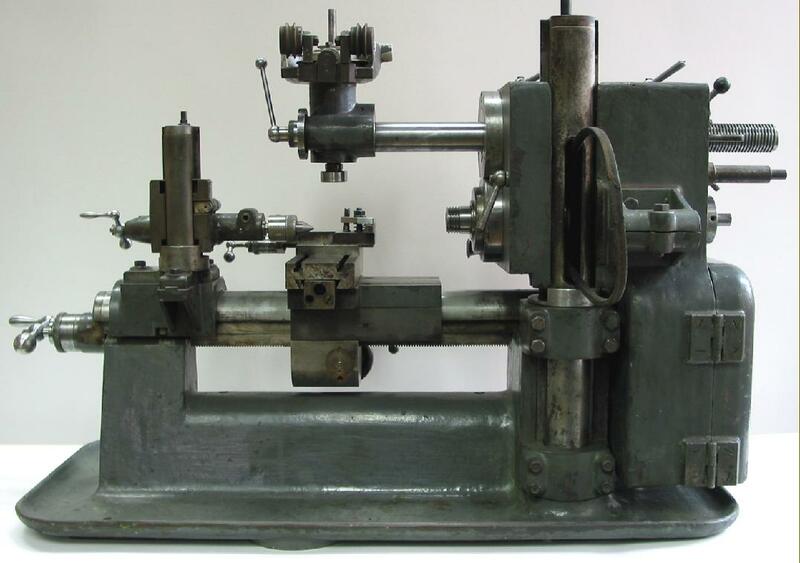 It appears that two sizes were made: the very much larger and heavier version had its centre height adjustable between 175 to 300mm and 1300 mm between centres - and the smaller (a machine capable of being bench mounted) with a capacity from 60 to 100 mm and 180 mm between centres. Complex, well specified, finely detailed and beautifully made both were able to perform as an effective backgeared and screwcutting lathe and as a horizontal and vertical milling machine. Considering the expense of tooling for such an involved product, the maker must have banked on selling at least two hundred examples - yet the one shown below in the photographs, the smaller type, is the sole example so far discovered. Of all its remarkable features it is easy to overlook perhaps the most radical, the bedways - formed by a semi-circular top cut away to form, at front and back, flat undersides and vertical surfaces. The saddle was joined across the bottom section to form a rigid assembly that carried the rack-pinion gear and leadscrew clasp nuts. 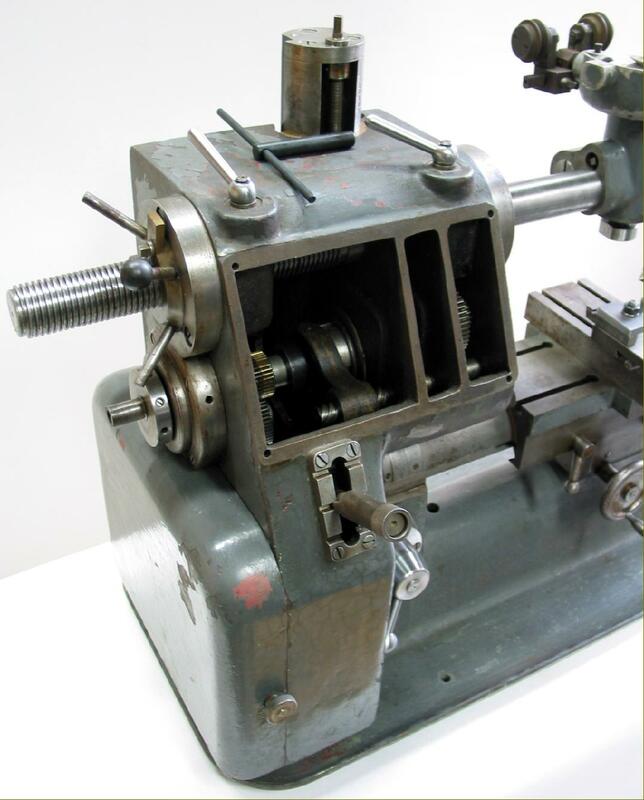 Despite the compromises inherent in the design, the machine had a compound slide rest, slow-speed backgear assembly, full screwcutting by changewheels (the leadscrew running underneath the bed) and was also equipped with tumble-reverse and a belt-driven fine feed. 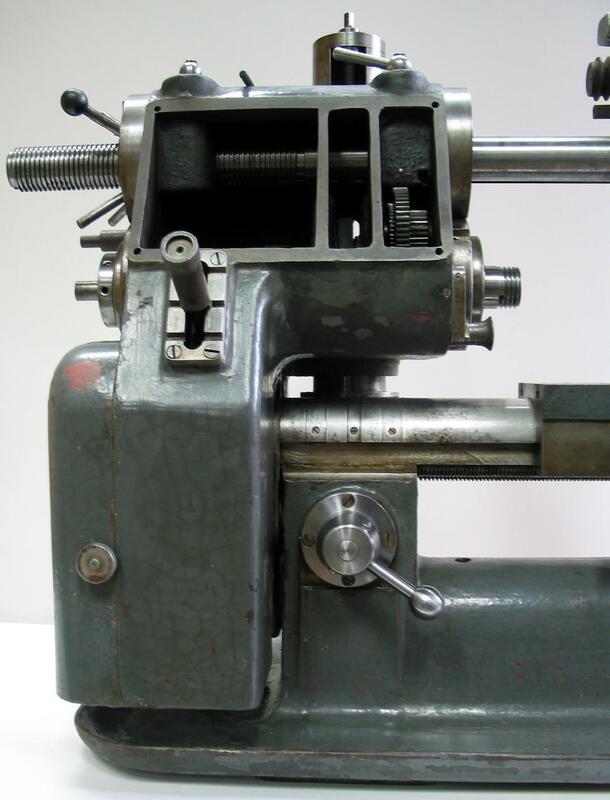 The compound slide was particularly well engineered: the feed-screw end plates were doweled in place and beautifully engraved micrometer dials fitted of a very reasonable size. 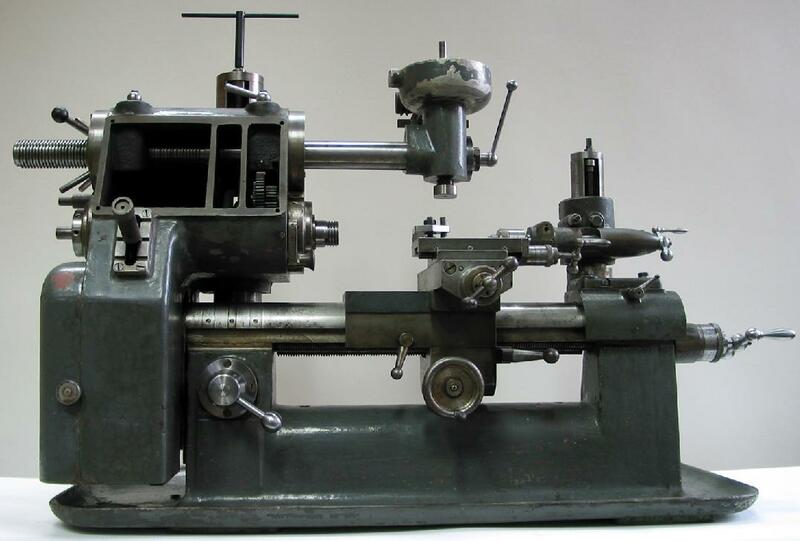 As a lathe it was obviously intended that it should function as well as any other conventional, smaller type. Unfortunately the original drive system on the smaller example found is missing--but would almost certainly have consisted of a motor-mounting plate carried on a bar that fitted into a clamp at the back of the headstock. 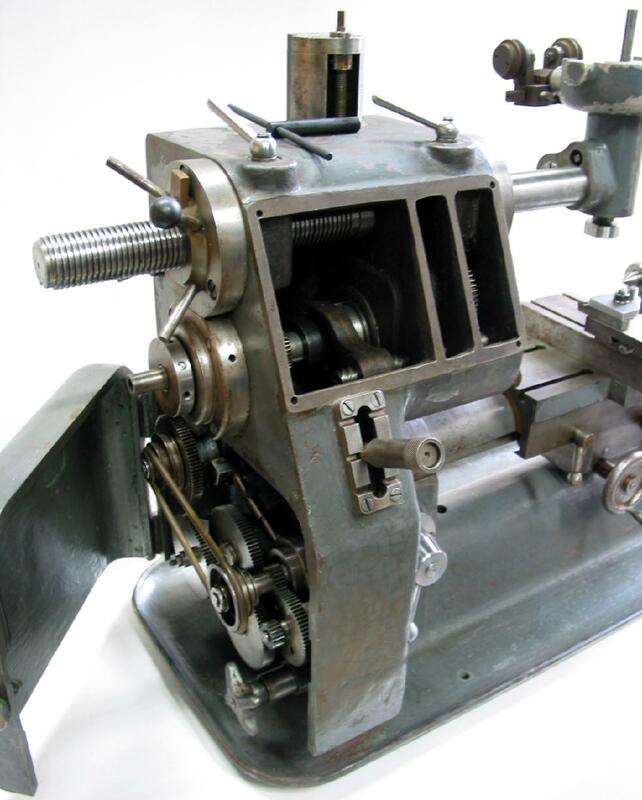 By this means the usual problem of keeping the belt tensioned as the headstock rose and fell was avoided - and also provided the chance to drive, by an extension to the motor pulley, the milling and drilling spindle. 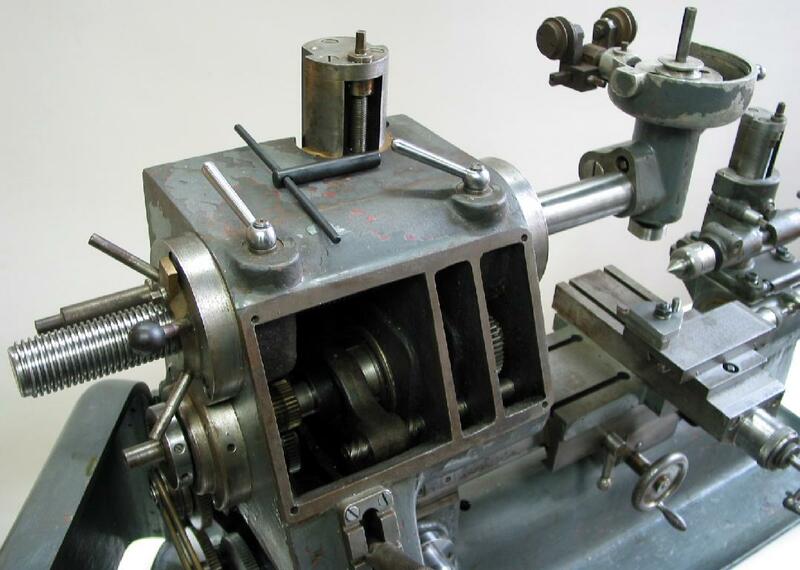 However, as parts are missing from the headstock end of this example, the drive for the milling and drilling head may well have been arranged in a similar manner to that on the larger type. Graduations were provided for both height elevation of headstock and tailstock, and the latter with a ruler graduation on its barrel. If the head needed to be angled over a degree scale on the face of the headstock allowed a precise setting - and even the boss surrounding the quick-feed quill lever was calibrated to act as a guide to the depth reached. 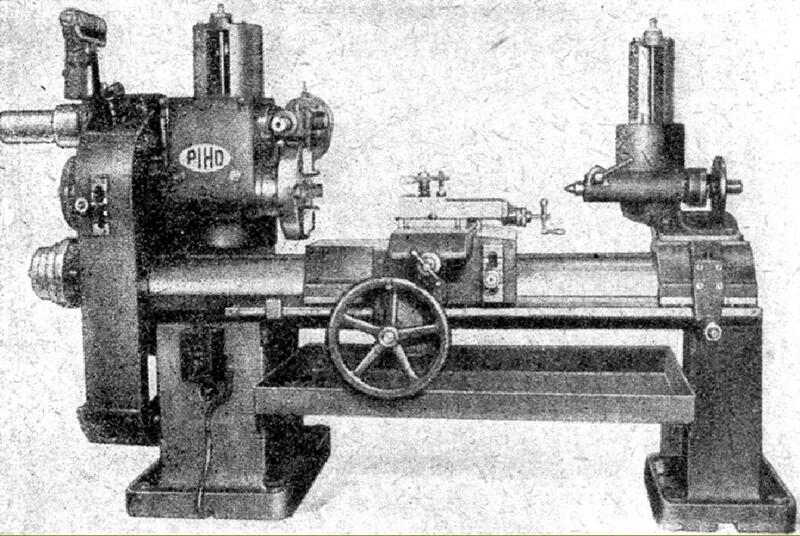 It is likely, given the adaptable nature of the machine, that a larger T-slotted boring table would have been either provided as standard, or offered as an option, to improve its versatility when used as a horizontal miller (the gear-driven low speeds also playing a part in making a success of this mode). 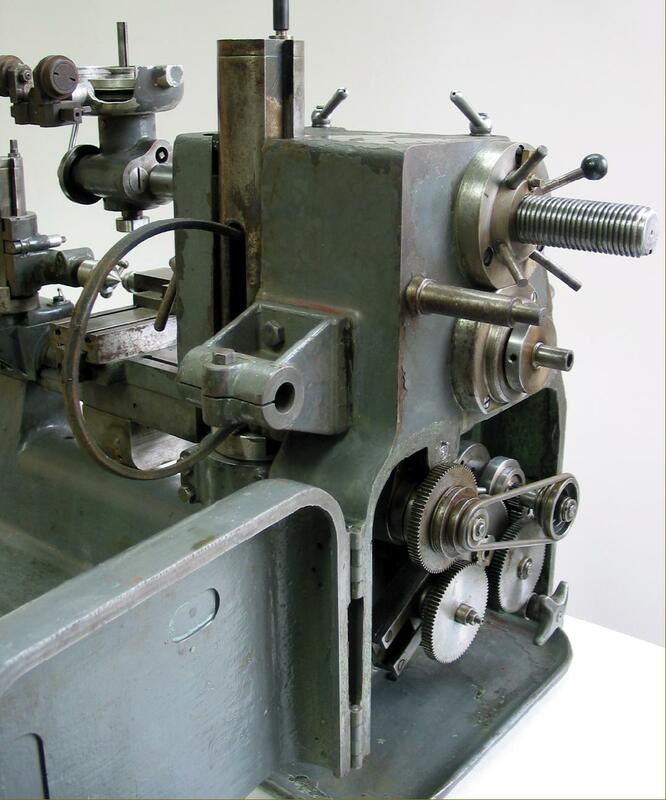 Other machines built along similar design lines were the Labormil, Impetus Metalmaster, and Murad Bormilathe.